From left to right, CFO of Arellano Construction Agustin Arellano Jr., Sweetwater Mayor Manny Maroño, FIU Senior Vice President for Advancement and CEO of the FIU Foundation Howard Lipman, OHL School of Construction Director Irtishad Ahmad, FIU Board of Trustees Chair Albert Maury, OHL Vice President Francisco Marin, FIU President Mark B. Rosenberg, President of Arellano Construction and member of the FIU Foundation Board of Directors Agustin R. Arellano, President and Chairman of the OHL Board of Directors Juan-Miguel Villar Mir, Vice President of Construction for Arellano Construction Frank Vilar, FIU Dean of the College of Engineering and Computing Amir Mirmiran, President of OHL-USA Lauro Bravar, FIU Board of Trustees Vice Chair Michael M. Adler. 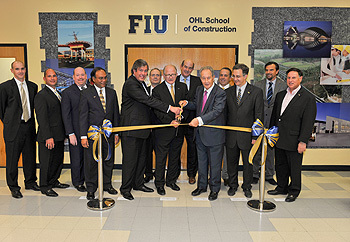 Global construction multinational Obrascon Huarte Lain (OHL) has partnered with the Florida International University’s College of Engineering and Computing to create the OHL School of Construction, the first named school in the history of the college. Since its establishment in Spain in 1911, OHL has evolved into one of the world’s largest construction corporations, leading major projects in more than 50 countries. In alignment with the expansion priorities of OHL, the partnership with FIU will address the demand for diverse construction industry professionals in Latin America and the Caribbean. Previously known as the OHL School of Construction, the OHL School of Construction’s faculty is involved in funded research projects and boasts the largest construction management graduate program in Florida. Established in 1973, the construction management program at FIU has educated more than 1,500 professionals. Graduates are employed by all major construction companies in the region. “The OHL School of Construction will be known as a global center for excellence in construction education. The school will prepare future generations of construction management professionals to build our future, transforming South Florida and beyond,” said Irtishad Ahmad, Director of the OHL School of Construction. 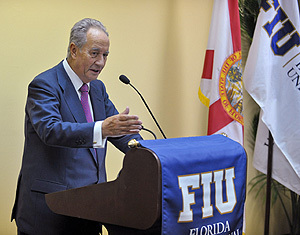 FIU President Mark B. Rosenberg noted that the new school’s mission is perfectly aligned with the university’s community engagement mission. The OHL School of Construction offers undergraduate and graduate programs including a fully Online MS in Construction Management program and a recently launched Professional MS in Construction Management. OHL is one of world’s leading construction and concessions groups proudly offering 100 years of experience. Over the recent years, OHL has been growing in a dynamic manner, with its international activities resulting in the multinational group that it is today with a remarkable presence in fifty countries across five continents. Currently ranked 21st among the largest international contractors by ENR, OHL is a global leader in building hospitals and railways. OHL is also ranked the world´s eighth largest transport infrastructure concessionaire (PWF) because the company operates a toll road network stretching more than 3,000 miles in more than 20 PPP projects around the globe. OHL is present in the United States from 2006 with the acquisitions of Community Asphalt and The Tower Group in Miami. Nowadays, the holding company OHL USA includes also Arellano Construction, Stride and BCA in Florida, and Judlau Contracting in New York. Together, the OHL firms are prepared to handle virtually any construction project in the United States, by the standards of quality and innovation that always have characterized the OHL Group.